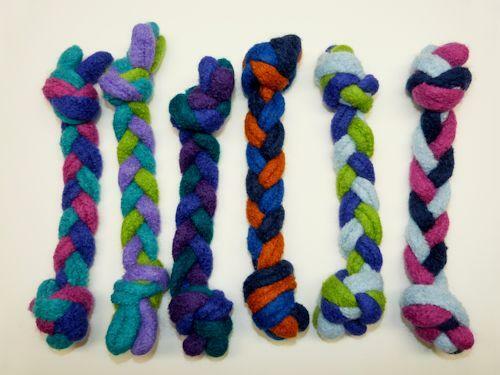 To create these colorful tug toys, I knit 3 tubes of wool, braid them, and knot the ends. Then I put them through the washer and dryer to shrink and tighten up the fabric to make it sturdy enough for almost any cat or dog. 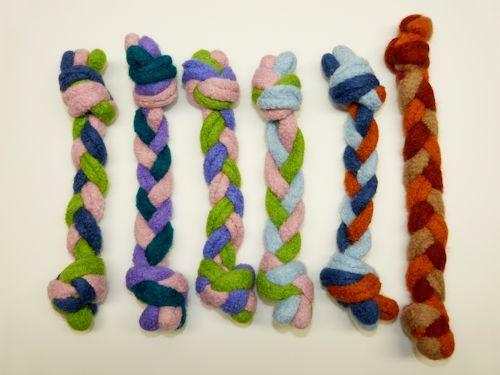 A wool tug toy is softer in your pet's mouth and provides a good grip for teeth and claws. 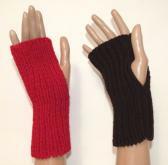 The knots on the ends make this one easy to grip or toss. Any time it needs cleaning, just throw it in with a load of laundry. Hot water is fine; it may shrink a little more, but not much. You can put it through the dryer or let it air dry. Most of these end up about 9" or 10" long. 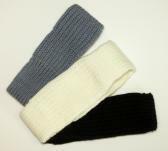 Not all of the color combos in the photos are currently available. If you have a color preference, feel free to ask; otherwise I'll choose one for you.